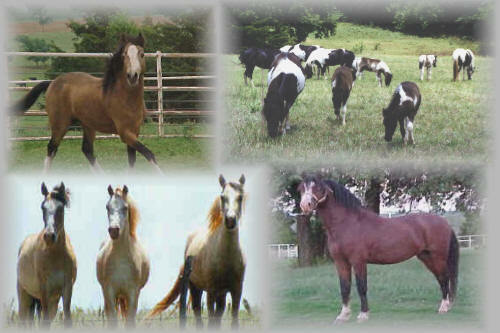 "Breeding National Grand Champions since 1977"
We invite you to look around and view all we have to offer. Here at Martin's Miniature Horse and Pony Farm, where the coffee is always hot and there's always a good story to share. We have bred and raised many Champion horses to include Martin's Best Dressed Sinatra, Martin's Mardi Gra's Radiant Redhead, Martin's Mardi Gra's Stop N Stare, Martin's Mardi's Million Dollar Baby, Martin's Mardi Gra's Wille Wille Hot, Martin's Mardi Gra's Maybenow, Martin's Mardi Gra's Fire N Ice, Martin's Boozer's After Dark, Martin's Boozer's Daring Difference, Martin's Dealers Choice, Martin's Boozer's Dark 'N Dazzling and many more. There's never a dull moment on the Martin Farm, so come see us soon. Send mail to bjmartin@brightok.net with questions or comments about our ranch and/or animals. Send mail to mike@strasslein.com with questions or comments about this web site.